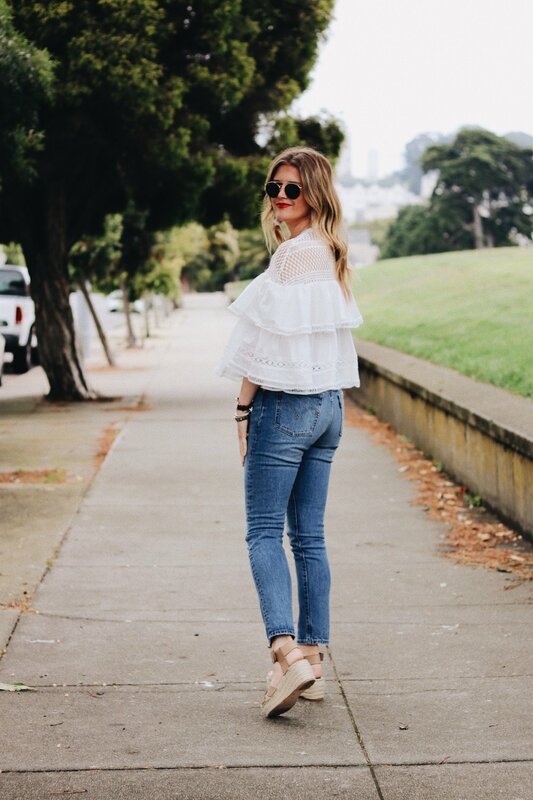 TIERED RUFFLE TOP + NORDSTROM SALE GIVEAWAY! Man, I can't believe the weekend is already over!! I had so (too) much fun in Cabo for my friend Courtney's bachelorette! As much fun as it was, it's always nice to get home! How cute is this top?! I love a good statement top and this one definitely fits the bill with the tiered ruffles! I also am obsessed with the bohemian touch with the crochet detail at the top! To finish off the outfit, I went with a classic pair of Levi's as you don't want anything else to be taking away from the fun top. I mean honestly though, can you ever go wrong with Levi's? If you don't yet own a pair of their 501 skinny, I highly (and I mean highly) recommend you invest in a pair. And when I say invest, the cost is very reasonable around $100! As always, you can shop this look below! AND THE BEST PART OF THIS BLOG POST?! I've teamed up with an amazing group of bloggers to give away a gift card to one of our readers to shop the massive Nordstrom Anniversary Sale!! See all details and enter to win at the bottom of this post!! ENTER HERE FOR THE NORDSTROM SALE GIVEAWAY!